Original Vintage lobby card from the 1938 Re-release of this most highly sought after horror classic. 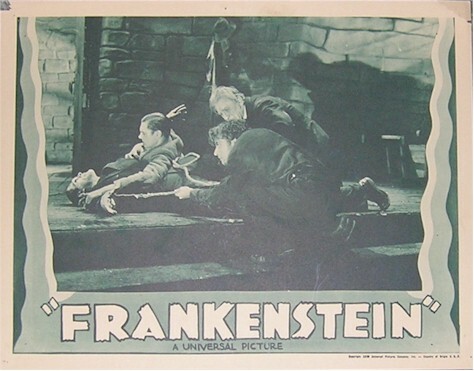 Great scene with the Monster being restrained by Dr Frankenstein and company. Serious collectors know the extreme Rarity of a lobby card from this title. A beautiful card from 1938 in NICE condition. Only minor flaws is the small chip out of top left border corner and a small 1-2" tear on right top border. We had one of these about 7 years ago and it sold for $1000 in one day. Won't LAST!